I just made this little quick project this weekend, and I love it! This idea is not original with me. I've seen it several places on the internet using teacups, and decided I had to make one for my sewing room. My old pincushion just didn't match with the decor in my new sewing room. My only problem was finding a teacup. The only teacups I had are family heirlooms. A trip to Hobby Lobby didn't even produce anything I could use, which was surprising. I didn't have the time or desire to go poking around garage sales or thrift stores. I did a few internet searches, but the only things that were coming up were expensive antiques. 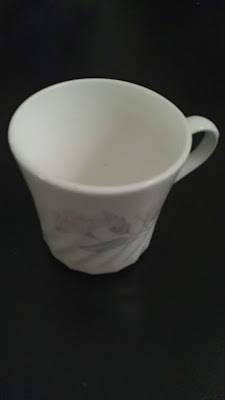 Finally, my husband suggested that I paint one of our old little coffee mugs. He always has great ideas like that. 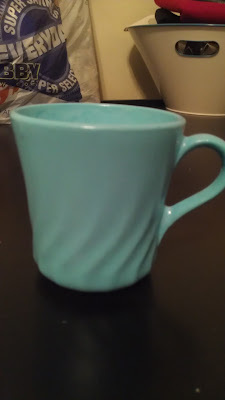 ...and painted it using the same color as I used on the boxes in my sewing room makeover. 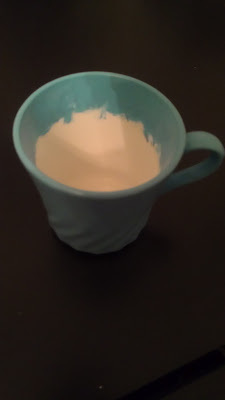 Now, I used acrylic paint (because that's what I had), but it is not designed for ceramics, and it is easy to clean off of Corelle dishes. This is why I often use my Corelle saucers as palettes. This didn't really matter to me for this project, because this thing will just be sitting by my sewing machine, and not getting handled a lot. I did, however, put a nice coat of Mod Podge over the whole thing to help seal it. Next, I took a roughly 12x12 inch square of some scrap damask fabric left over from my wall hanging and chair cushion and put a good-sized handful of polyester stuffing on it. 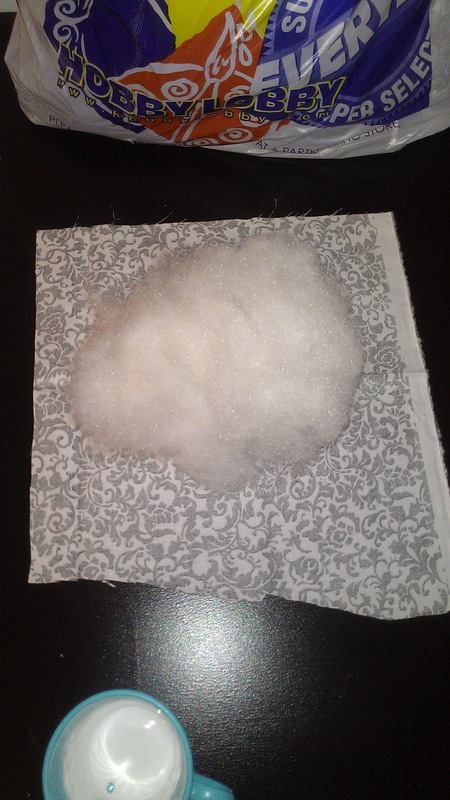 Then I pulled up the corners of the fabric around the stuffing and used a rubber band to hold it all together. All that was left then was to invert it and put it in the coffee mug! 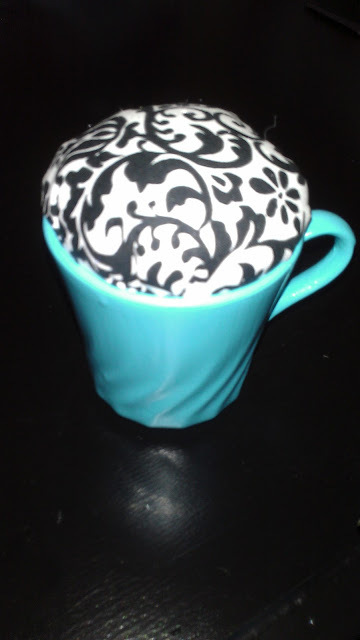 The fabric pouf was a little bigger than my mug, which was perfect, because it had a nice snug fit. I intended to use hot glue around the edges, but it fit so snugly that I haven't bothered yet. 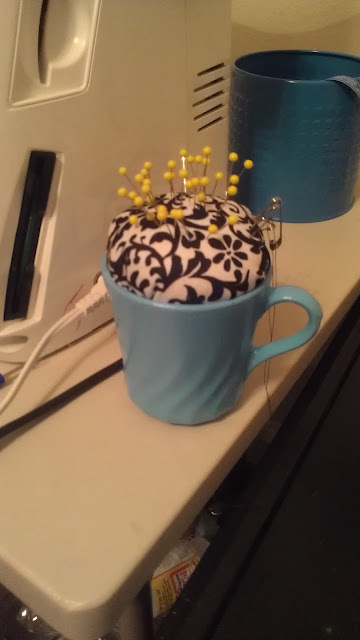 My new pincushion was ready to go! If I hadn't decided to paint an old mug, this would have been a five-minute project. 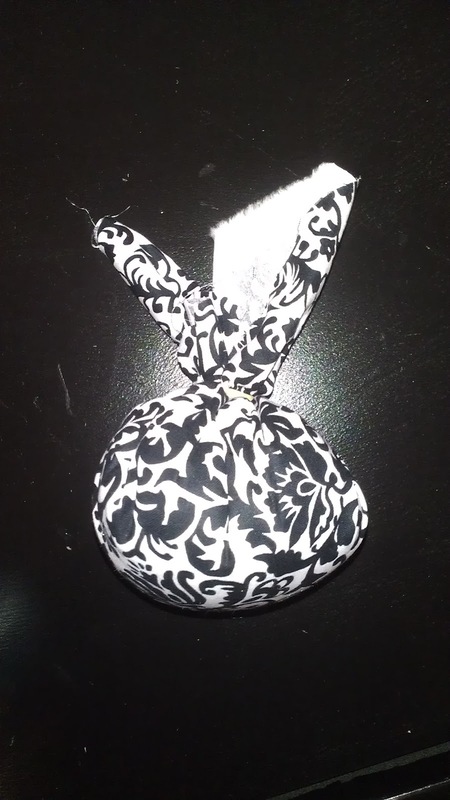 I love fast, easy, and cheap projects that are also adorable. I'm going to be a first-time auntie in just three more months! I'm so excited, and enjoying getting to make things for a baby. 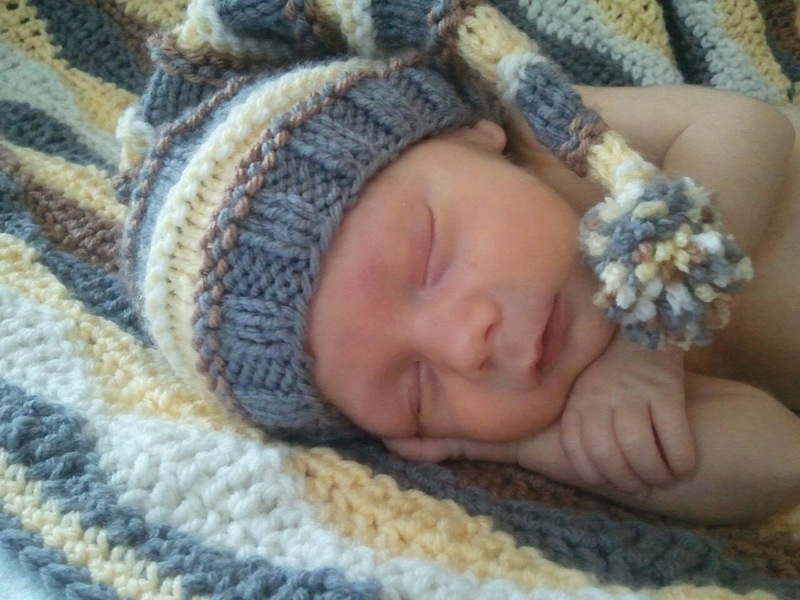 My sister saw some newborn pictures with babies wearing knitted hats with long tails and loved the idea. She asked if I could make something similar to the one she saw. I looked around for patterns and finally found one I could adapt. 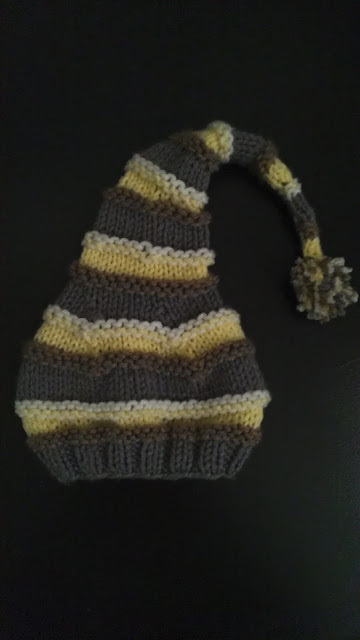 I used her nursery colors of gray and yellow, with white and brown accents. I have never written a knitting pattern before, but I will try to write out the pattern soon. It will probably happen in a few weeks when school is out. Until then, here is the picture. It looks cute here, but I can't wait to see how cute it will look on their new little bundle of sunshine! UPDATE: Here he is, in all his sweet cuddly cuteness! So, I finally got around to writing the pattern...sort-of. I've actually improved the fit of it. You can find the pattern here. Don't have the time or inclination to make this for yourself? Check out my Etsy shop and have me make one for you!